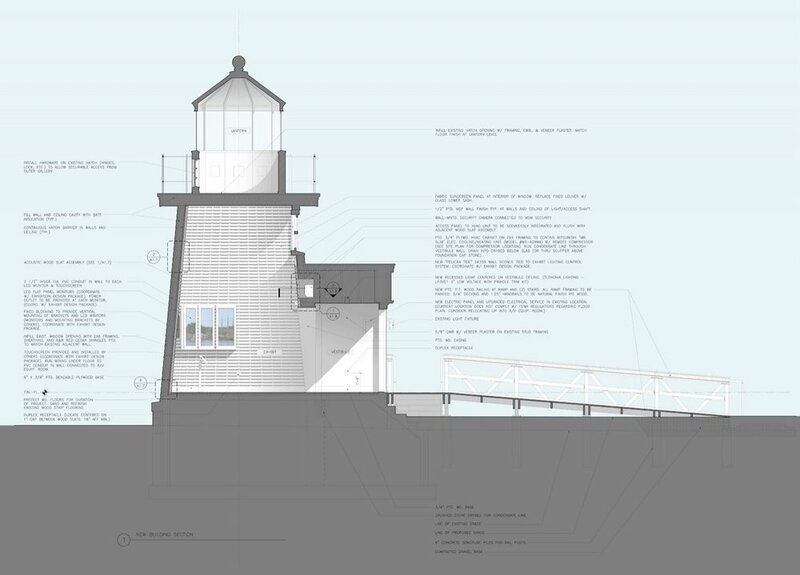 As part of their ongoing improvements to the Mystic Seaport campus, Oudens Ello Architecture were asked in late 2007 to develop design proposals for Lighthouse Point, which included renovations to an existing lighthouse structure on the Point, a replica of the Brant Point Light on the island of Nantucket. Previously not a part of the overall visitor experience, the renovated lighthouse is now an important destination within the Seaport and accommodates an interactive exhibit showcasing historical lighthouses throughout the United States (exhibit design by UK-based firm Haley Sharpe Design). The fully handicapped accessible exhibit venue required high-performance acoustical treatment suitable for audio-visual display in a single, conical room of little more than 100 square feet. To that end, OEA developed a multilayered system of open wood slats and sound absorptive material creating an interior environment evocative of a Nantucket basket. The renovated lighthouse was opened to the public on July 4, 2008.